On January 27, 2018 at approximately 12:15pm local time, a vehicle resembling an ambulance and laden with explosives detonated after it passed through a police checkpoint in Kabul, Afghanistan. The explosion killed more than 100 people and wounded approximately 235 others. According to the deputy spokesperson for the Afghanistan Interior Ministry, the vehicle was painted to resemble an ambulance and had successfully passed through a checkpoint after the attacker allegedly told police he was transporting a patient to a nearby hospital. While stopped at a second checkpoint farther inside the city limits, the attacker detonated the explosives concealed in the vehicle. 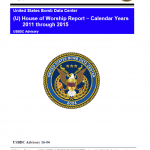 This report serves to present information and analysis associated with fire, arson, and bombing incidents at houses of worship (HOWs) occurring within the United States for the past 5 years, between January 2011 through December 2015, and reported to the Bureau of Alcohol, Tobacco, Firearms and Explosives (ATF). In total, there were 733 fire and explosion related incidents, per ATF reporting, for all 50 States. The information contained herein does not represent all fire, arson and bombing incidents for the United States. This report only represents those incidents that have been reported to and investigated by ATF. 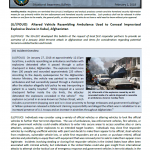 A situational awareness bulletin released by the New Jersey Regional Operations Intelligence Center following recent bombings utilizing improvised explosive devices (IEDs) in the New York/New Jersey area. A collection of all Combat Integration Support Team (CIST) Global IED Reports for the month of June 2016. The reports are produced by the Joint Improvised-Threat Defeat Agency, formerly the Joint Improvised Explosive Device Defeat Organization (JIEDDO). 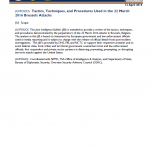 This Joint Intelligence Bulletin (JIB) is intended to provide a review of the tactics, techniques, and procedures demonstrated by the perpetrators of the 22 March 2016 attacks in Brussels, Belgium. The analysis in this JIB is based on statements by European government and law enforcement officials cited in media reporting and is subject to change with the release of official details from post-incident investigations. This JIB is provided by DHS, FBI, and NCTC to support their respective activities and to assist federal, state, local, tribal, and territorial government counterterrorism and law enforcement officials, first responders and private sector partners in deterring, preventing, preempting, or disrupting terrorist attacks against the United States. Shabaab al-Mujahideen (aka al-Shabaab, aka Mujahideen Youth Movement) is the Salafist-Jihadist off-shoot of the Mogadishu-based Islamic Courts Union (ICU). Al-Shabaab’s leaders maintain connections with al-Qaeda, and receives financial, logistical, and rhetorical support. The group is fighting the internationally recognized TFG for control of Somalia’s southern cities, and ultimately seeks to control the entire Horn of Africa. Al-Shabaab employs IEDs in support of its broader strategy of ousting the TFG and the contingent of African Union peacekeepers (mostly from Uganda and Burundi) protecting the TFG, called the African Mission in Somalia (AMISOM). As a result, their IEDs target TFG and AMISOM personnel and operations. Al-Shabaab will continue to focus its IED efforts against TFG and AMISOM operations, primarily in Mogadishu, as part of an al-Qaeda-inspired strategy of attrition and exhaustion. Despite official statistics showing a decrease in the number of arrests related to Salafist-jihadist activity, EU-based security services have thwarted numerous IED-centered plots since 2003. 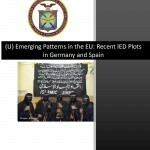 Many of the EU plots involve al Qaeda-networked terrorists in Afghanistan and Pakistan, and included plots in Spain, Germany, Italy, Belgium, and the United Kingdom (UK). Two recent plots are representative of the current IED threat in the EU: the Sauerland plot in Germany (2007) and the Barcelona plot in Spain (2008). An analysis of recent suicide bombings throughout the Middle East, Europe and Africa by the FBI Terrorism Explosive Device Analytical Center (TEDAC) that was released after the terrorist attacks in Paris, France last month states that “suicide vest and belt improvised explosive devices (IEDs) in the Middle Eastern, African, and European regions likely . . . have minimal correlation” and do not indicate tactical migration. Recent improvised explosive device (IED) and active shooter incidents reveal that some traditional practices of first responders need to be realigned and enhanced to improve survivability of victims and the safety of first responders caring for them. 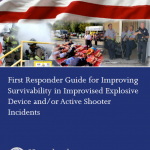 This Federal, multi-disciplinary first responder guidance translates evidence-based response strategies from the U.S. military’s vast experience in responding to and managing casualties from IED and/or active shooter incidents and from its significant investment in combat casualty care research into the civilian first responder environment. 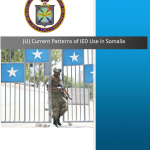 Additionally, civilian best practices and lessons learned from similar incidents, both in the United States and abroad, are incorporated into this guidance. Recommendations developed in this paper fall into three general categories: hemorrhage control, protective equipment (which includes, but is not limited to, ballistic vests, helmets, and eyewear), and response and incident management. Since the May 2010 publication of the Roll Call Release “Terrorist Use of Propane Cylinders,” terrorists have continued to advocate the use of propane cylinders in building improvised explosive devices (IEDs). 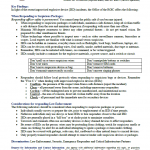 Throughout 2014, al-Qa‘ida-inspired violent extremists posted on the Internet English-language instructions for building and using propane IEDs and encouraged attacks in the United States. The posts recommended military, commercial, and financial sector targets, major metropolitan areas, and mass gatherings. In January 2013, insurgents in India placed improvised explosive devices (IEDs) in the bodies of two police officers who were killed during an ambush; these devices probably were designed to target first responders, medical personnel, and medical facilities. This Joint Intelligence Bulletin (JIB) provides information on the 21 September 2013 attack in Nairobi, Kenya likely conducted by al-Shabaab—an al-Qai‘da linked militant group based in Somalia. 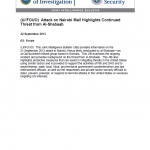 This JIB examines the ongoing incident and provides background on the threat from al-Shabaab. This JIB also highlights protective measures that can assist in mitigating threats in the United States using similar tactics and is provided to support the activities of FBI and DHS and to assist federal, state, local, tribal, and territorial government counterterrorism and law enforcement officials, as well as first responders and private sector security officials to deter, prevent, preempt, or respond to terrorist attacks in the United States or overseas targeting US interests. Fireworks are a common component used in Improvised Explosive Devices (IEDs). The US Government is asking consumer fireworks retailers to be aware of this phenomenon and familiarize themselves with some possible indicators of suspicious activity. This list is not inclusive, nor is it intended to limit the lawful conduct of innocent persons. The totality of behavioral indicators and other relevant circumstances should be considered. 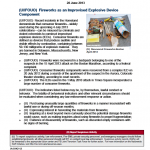 Recent incidents in the Homeland demonstrate that consumer fireworks—widely used during the upcoming 4 July 2013 celebrations—can be misused by criminals and violent extremists to construct improvised explosive devices (IEDs). Consumer fireworks are defined as devices that produce audible and visible effects by combustion, containing between 50-130 milligrams of explosive material. They are banned in Delaware, Massachusetts, New Jersey, and New York. National Counterterrorism Center Says IED Precursors Widely Available in U.S. The National Counterterrorism Center (NCTC) warned in November of last year that precursor components needed to produce improvised explosive devices (IEDs) are “widely and legally available in sufficient quantities through a variety of sources” in the U.S. and are difficult to regulate due to their legitimate uses. 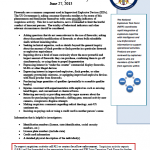 This Joint Intelligence Bulletin provides law enforcement and private sector safety officials with protective measures in light of the recent explosions that took place at the 2013 Boston Marathon in Boston, Massachusetts. The information is provided to support the activities of DHS and FBI and to assist federal, state, local, tribal, and territorial government counterterrorism and first responder officials and the private sector to deter, prevent, preempt, or respond to terrorist attacks in the United States. 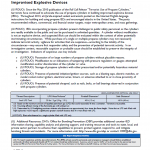 This Joint Intelligence Bulletin provides information on the devices used in the 15 April 2013 Boston Marathon explosions. The information is intended to provide aid in identifying devices and to support the activities of DHS and FBI and to assist federal, state, local, tribal, and territorial government counterterrorism and first responder officials and the private sector to deter, prevent, preempt, or respond to terrorist attacks in the United States. This is an update of an RCR published on 1 July 2010. Rudimentary improvised explosive devices (IEDs) using pressure cookers to contain the initiator, switch, and explosive charge frequently have been used in Afghanistan, India, Nepal, and Pakistan. Pressure cookers are common in these countries, and their presence probably would not seem out of place or suspicious to passersby or authorities. Presence in an unusual location—or if noticed in a contanier such as a backpack—should be treated as suspicious. The FBI assesses with high confidence recreationally used exploding targets (ETs), commonly referred to as tannerite, or reactive targets, can be used as an explosive for illicit purposes by criminals and extremists and explosive precursor chemicals (EPCs) present in ETs can be combined with other materials to manufacture explosives for use in improvised explosive devices (IEDs). Although most terrorist IED attacks outside war zones target civilians or symbols of authority and usually involve a single device, some are designed specifically to target emergency response personnel. The most common tactics involve using secondary or tertiary devices in tiered or sequential attacks intended to kill or maim response personnel after they arrive on the scene of an initial IED incident. This field guide provides small unit leaders and individual Soldiers and Marines a proven collection of actions to focus their efforts while attacking networks. Primarily, these actions consist of mission analysis, briefing, and execution and are adapted for use by these small unit leaders in a population-centric operating environment. Casualties resulting from the use of improvised explosive devices (IEDs) have risen significantly in 2012 according to statistics from the Department of Defense’s Joint Improvised Explosive Device Defeat Organization (JIEDDO). 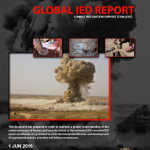 Over a 25-month period from August 2010 through August 2012, JIEDDO found that global IED casualties reached their peak in May 2012 with approximately 1800 people wounded and nearly 600 killed in that month alone. 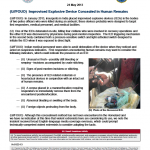 A monthly report from the Joint Improvised Explosive Device Defeat Organization (JIEDDO) detailing IED usage and casualties statistics from every U.S. combatant command for August 2012. 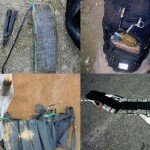 Some criminal bombers exploited their victims’ sense of greed or general curiosity by hiding improvised explosive devices (IEDs) inside common everyday items and leaving them as discarded merchandise to be found by the victim. Victims then perceived these situations as an unexpected opportunity to obtain an object of value with no associated cost. The devices utilized victim-operated switches rather than command or time switches. While a seemingly discarded working tool or item could be considered an enticement in itself, the lack of a written note or similar enticement distinguished these bombing incidents from other IEDs that utilized written messages to bait the victim. Recent bombing incidents in Phoenix and Glendale, Arizona, might be another example of this tactic. This first edition of the Attack the Network (AtN) Lexicon was produced by the Joint Improvised Explosive Device Defeat Organization (JIEDDO). The lexicon contents were developed after extensive interviews with military units who successfully employed AtN principles and practices to reduce the number and effectiveness of Improvised Explosive Devices (IEDs) in the Counter-Insurgency (COIN) environment where they encountered multiple and sometimes interconnected adversary networks. The lexicon contents were further developed and refined by subject matter experts from over fifty organizations across the Departments of Defense, Justice, and Homeland Security.